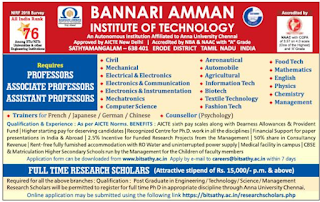 Bannari Amman Institute of Technology, Erode has advertised in The Hindustan Times newspaper for the recruitment of Professor / Associate Professor / Assistant Professor vacancies. Interested and eligible job aspirants are requested to apply with in 7 days. Check out further more details below. 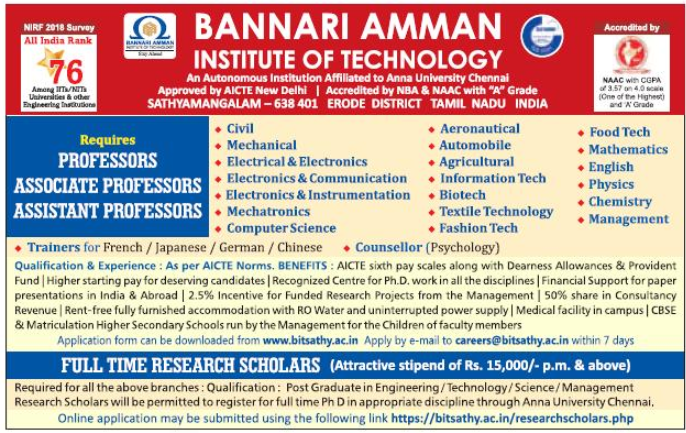 About College: The Bannari Amman Institute of Technology, established in 1996 by the Bannari Amman Group, serves as one of the citadels of higher education in the Southern part of India. BIT aids to impart knowledge, teamwork, innovation, entrepreneurship, courage, sacrifice and duty which are innards of a meaningful life. BIT has transformed and ingrained various cutting edge administrative and academic reforms. The Institute caters to the needs of the students and members of faculty in realising their dreams and aspirations. BIT has been conferred with a number of accolades and recognitions from top-notch forums of high eminence.